Open is used to open a file located on a storage device such as your hard drive. 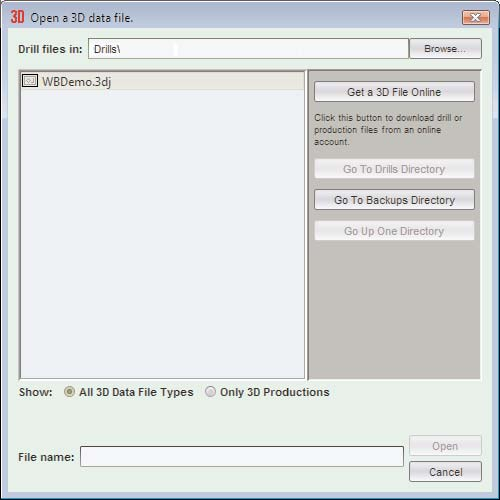 Selecting Open from the File menu will display the Open a Drill File dialog. “Drill files in” shows the directory on the storage device that is displayed in the file list. Browse allows you to choose a different directory to look in. The drill file list contains drill files, drill packages and folders. Clicking on any of them and clicking Open will open the selection in the list. Go to Drills Directory will show the list of drill files in the default drill files directory. Go to Backups Directory will show the list of drill files in the default backup drill files directory. The location of the backup drill files directory can be changed from the Application Options: Backups tab of the File menu. Go Up One Directory will move up one directory from any sub-folders found in the directory you are currently viewing.